Prayers to St. John of God, Patron Saint of Heart Diseases, including Heart Attacks, Cardiac Arrest, Arrhythmia, Heart Murmurs, Heart Value Disease, Irregular Heart Beat, and other cardiac and other cardiovascular diseases. 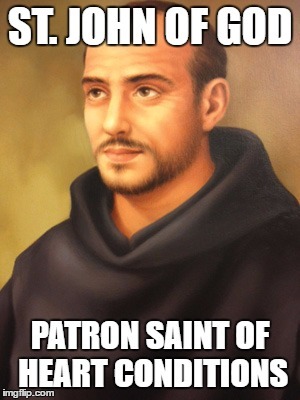 St John of God was born in Portugal and lived a very eventful life. He spent much of his time in the military until eventually he found it hospitals and places for the sick and poor. Later the followers of Saint John of God formed what became known as The Brothers Hospitallers St John of God which is now a worldwide Catholic organization 4 caring for poor sick and those suffering from mental disorders. Here is a prayer which can be said for the intersection of Saint John of God for people suffering from any form of her issue. St John of God, you are honored as the patron of those who are afflicted by heart disease. Obtain for me the Grace from God to be well again. Bless me with a healthy heart, I asked you for your intercession and help. Grant that I received the favor for which I ask Through Jesus Christ, Our Lord. Amen.